Since its creation, the University of Wisconsin System has established itself as one of the world’s premier public university systems. The UW educates more than 170,000 students on 26 campuses, and serves more than one million citizens through statewide extension programs. The UW System’s campuses in Madison and Milwaukee offer both undergraduate and graduate degree programs, including doctoral and professional programs. Eleven comprehensive campuses provide students both undergraduate and master’s degree programs in smaller, more individualized academic settings. The UW System’s 13 freshman-sophomore campuses offer courses for students seeking a foundation for a bachelor’s degree. Extension works with all 26 UW campuses, all 72 Wisconsin counties, and a wide variety of other educational partners to bring UW expertise to all corners of the state. All UW System campuses and extension programs provide Wisconsin’s citizens with opportunities to contribute to the state’s growing “knowledge economy” through the UW System’s three-pronged mission of teaching, research and public service. Explore interactive charts and maps of information about UW System and UW institutions. 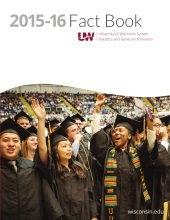 Get information on academics, enrollment, faculty and staff, and more, compiled annually.